End of the Month - Print those Coupons! How does the end of the month sneak up on us like this? If you can believe it, it's almost the end of March! File through those coupons (lots are expiring 3/31!) to be sure you use any that you want to use and be sure to print all the coupons you want from coupons.com before they're gone! In the next few days, we should be seeing new coupons pop up on coupons.com. I'll keep you posted to be sure you print any that you want before they're gone as well! For now, I'd be sure to print the .75 Jello, .55 Hillshire Farm, and the .75 Gold'n Plump coupons (if they're still available). I had a chance to get over to Cashwise last night. Here are some more deals I found along the way! Arby's Coupon: Free Sandwich with Drink Purchase! Head on over here to print an Arby's coupon for a FREE Regular Roast Beef Sandwich with any soft drink purchase. Anytime you make a purchase at Arby's, turn your receipt over. There is a short survey you can make on the phone or online. At the end of the survey, you'll get a code to write on the receipt, which is good for a FREE Regular Roast Beef or Beef and Cheddar. No other purchase required! Then, make sure you ask for your receipt - you should get one even with your free sandwich. Turn it over and look for the survey... And, do it all over again. You get the point! Don't forget to head over here to view and print Our Family Coupons before you shop! Use the .70/1 Frosted Flakes, Fruit Loops blinkie machine coupon (will double to $1), the $1 Special K coupon or the $1.50/2 Raisin Bran or Frosted Mini Wheats coupons here or here. Final price: as low as $.99/box. Between 3/19 and 4/10, purchase 3 Kellogg's cereals in one transaction and receive a checkout coupon good for one gallon of milk. Purchase 5-6, receive 2 FREE gallon of milk. Purchase 7 or more, get 3 FREE gallon of milk coupons. Purchase 3 cereals, pay as little as $.99 each after coupon. Plus, get a coupon for a FREE gallon of milk. Purchase 5 cereals, pay as little as $.99 each after coupons. Plus, get a coupon for 2 FREE gallons of milk. Purchase 7 cereals, pay as little as $.99 each after coupons. Plus, get a coupon for a 3 FREE gallons of milk. If you consider a gallon of milk to be worth about $3, all of these scenarios equal out to FREE or better than FREE cereal after the milk coupons! Use any of the many $1 coupons good on any Fisher Product 4 oz or larger. $1 off any Nash Brother's Trading Company Product coupons available throughout the store or here. This coupon states 1 per customer per visit, so I usually print several at a time, then just use 1 each time I go to Sunmart. Here are the Nash Brothers Trading Company items I've found throughout the Fargo/Moorhead stores, and some of the prices. I'll fill in more as I find them. Newspaper/Online Only Coupons! 3 Coupons Not available in store - Print here. Even better, I've heard rumors of a Catalina deal running on Betty Crocker Potatoes through 4/18 where you'll receive a .50 Catalina coupon when you purchase 1, a $2 Catalina coupon when you buy 2, and a $3 coupon when you buy 3. I haven't been to Cashwise to be able to confirm it. If you've seen these signs posted at Cashwise or received a Catalina, let us know in the comments! Update: Looks like Cashwise is not running this Catalina. Final price: $1.17 each when you buy 2! Final price: $1.36-$1.96 for both, plus get $1 off Strawberries! Update: Strawberries are only $2.34 this week, making them only $1.34 after the coupon! Final price: .48 each when you buy 2! Other stores are running a Catalina deal on Dole Pineapple: Buy 4, get a .50 Catalina coupon at checkout. If this is running at Cashwise, buy 4 cans and use 2 coupons. Pay $1.92, get .50 coupon back. Final price of .36 each! Can anyone confirm if Cashwise is running this Catalina deal? I've spotted $1/1 peelies on these at some stores. If Cashwise has them, snag these for only .98! Final price: $1.13 each when you buy 2! I haven't found the Slider variety, but if you do, use the .55 coupon from the 2/21 SS (double to $1 each) and get an even better deal! Though this is a higher price than regular beef, if you normally buy this brand, this is a great price! It rarely goes below $4.98. Final price: as low as .98! Final price: .73 each when you buy 4! I've been waiting all month to see if we would get free veggies, but it looks like .28 is the best we'll get for now at least. Mix and Match any of the Gedney products above and take .50 off each product when you buy 2 and use the coupon. Look for $1 blinkie coupons in stores, I haven't seen these, but have heard reports. Would bring them to $1 each! Final price: $2.98 per Jumbo pack! Pay only $1.56, get a .50 Catalina coupon back. Only .27 each! Sometimes my Catalina coupons double as well. So, when I use it, the .50 coupon doubles to $1. If this is the case, the pineapple is nearly FREE with the regular priced pineapple! Lastly, when these Catalina sales run, they are often at all 3 of our grocery stores: Hornbacher's, Cashwise and Sunmart. The Cashwise regular price on this same product is .88 and I don't know about Sunmart. (If you can confirm, let us know) I think we will see a sale price for sure in one of the store in the next few weeks. I'm hanging on to my coupons! Thanks to Brenda for letting me know about this one! Final price after coupons and Catalina: .63-.83 each! Again, these are regular prices and likely this deal runs for a few weeks. Unless you need them, we might see a sale price during the Catalina deal! Any other deals at Hornbacher's this week? Let us know in the comments! 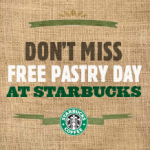 Starbucks FREE Pastry Day - Today! Today is Starbucks Free Pastry Day! Purchase any handcrafted, brewed or iced beverage before 10:30AM today and receive your choice of pastry FREE with this coupon! 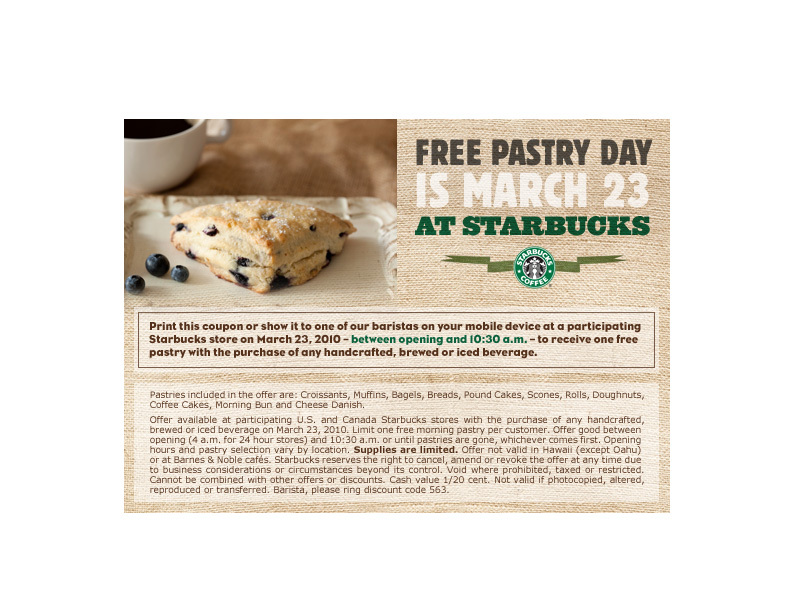 I know it's not the best freebie because there's a purchase required, but hey - some of you are already stopping at Starbucks, may as well get a FREE pastry! And, maybe a FREE baked good is enough to get you into Starbucks for a treat, like me! Final price: .22 each when you buy 6! Final price: $2.98, less than $1/lb! There are a few GREAT freebies this week at Sunmart! Plus, Our Family has released LOTS of new Our Family Coupons. Head on over here to view and print them! For $5.50, purchase 2 Dole Salad Blends and get the following for FREE with in-ad coupon! 1 lb Roma Tomatoes, Cucumber, Our Family Salad Dressing and 10 oz Shredded Carrots. It's a deal, but only if you'll make use of all of it! The price averages out to under $1 per item. Use the .70/1 Frosted Flakes, Fruit Loops and Corn Pops blinkie machine coupon I've seen in the cereal aisle at Hornbacher's and Sunmarts or the $1.50/2 Raisin Bran or Frosted Mini Wheats coupon here or here. Final price: as low as $1.50/box. Purchase 3 cereals, pay as little as $1.50 each after coupon. After Milk coupon, it's like paying as little as .50 per box. Now we're talking. Purchase 5 cereals, pay as little as $1.50 each after coupons. After Milk coupons, it's like paying as little as .30 each! Purchase 7 cereals, pay as little as $1.50 each after coupons. After Milk coupons, it's like paying as little as .22 each! Tip: This Catalina deal runs through 4/10. There are likely to be even better deals on cereal. If you have coupons expiring or need cereal, this is a good deal, but if you can wait, my cheapskate sense tells me that we'll see a better sale price than $2.50, making for even less expensive cereal, and possibly even FREE after coupons and Catalina! $1 off any Nash Brother's Trading Company Product coupons available throughout the store or here. This coupon states 1 per customer per visit, so I usually print several at a time, then just use 1 each time I go to Sunmart. Final price: $1.52 for 4 sauces and 1 pasta! Final price: .63 each when you buy 4! Final price: as low as $1.58! Use the $1 coupon here or the .40 coupon that was previously available to print. I've seen signs at other stores for a Catalina deal that ends today, 3/21. Buy 2, get $2 coupon back at checkout. Final price after Catalina if this is working at Hornbacher's: $1 each when you buy 2! Big News for FM Cheapskate! As you can tell by the absence of Sunmart deals and other posts this week, it's been an out-of-the-ordinary week here. Many of you are in the Fargo area and know we've been busy physically and emotionally preparing for another Red River flood. Thankfully, this year the crest is predicted to be lower, and the preparation has seemed to be less chaotic than last year. All that being said, in addition to watching the river rise, there has been a lot going on behind the scenes here at FM Cheapskate. I'm working with a few new advertisers to bring you more ads that are relevant and even more coupons right on my site. Perhaps, ok, definitely the MOST exciting news I have for you today is that I, yours truly, FM Cheapskate, am going to be providing the weekly Cashwise and Sunmart deals for a blog that has inspired me and encouraged me in my and literally thousands of others as well: Money Saving Mom! Money Saving Mom is launching a National Store Deals list and Cashwise and Sunmart are included! (At this time, Hornbacher's won't be included.) How cool is this?? Needless to say, it's been tough to keep it in til now. I've been waiting to tell you til it launch and I could direct you there. Ready to see me on a blog I never thought in a million year I'd be featured on? Head on over here. Run, Don't Walk - HOT $3 Huggies Coupon! Hurry on over here to find a HOT coupon for $3 off any Huggies diapers purchase! Print 2 per computer - and print it now, this certainly won't last long! Collin, over at Hip2Save, has a Kmart scenario worked out where you can get Huggies Jumbo packs for only .75 per pack! Yes, I said .75 per jumbo pack! Get the details here. Run, don't walk to get this printed and head out to Kmart! Head on over here to view LOTS of local coupons available through Fargo Pages! These coupons update weekly and if you'd like to make it easy on yourself, sign up here to get them delivered to you by email weekly. Added bonus: through Tuesday March 16th, signing up to receive coupons by email enters you to win 2 FREE airline tickets, courtesy of Travel Leaders in Fargo! Drawing will be held Wednesday, March 17th! Look for the peelie coupons on the products to sweeten the deal! You can use up to 3, then the B3G1 FREE coupon to get the 4th one FREE! I believe these at $3.99 regularly, so $2 each when you buy 2! Looks like tacos this week, kids! Any other deals I missed? Leave a note in the comments and let us know! Hallmark Gold Crown FREE Card - Extended til 4/14! Hallmark has extended their FREE card from the Kids Collection promotion through 4/14! Hallmark Gold Crown Stores are giving each customer a FREE card from the New Kids Collection, no coupon needed! There are 9 designs to choose from, and the FREE card offer is only while supplies last! For more information, head over here. Final price: 4 for FREE! Did you snag any other deals at Hornbacher's this week that I missed? Let us know in the comments! If you head out today to buy your Star Tribune today, look for 2 coupon inserts, a SmartSource and a RedPlum. EDIT: I've heard from a few folks that there's no RedPlum today. Maybe tomorrow? Hopefully! 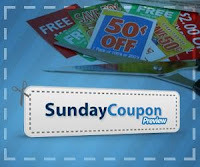 For a full preview of the coupons included, head over to the Sunday Coupon Preview! 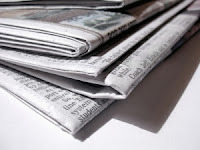 I just posted a full FAQ on buying the weekend papers for coupons. Check it out here! In our area, I recommend buying the Minneapolis Star Tribune. The Star Tribune carries many more coupons than the smaller local papers, because Minneapolis is a much larger market. Added bonus: Now Saturday's Star Tribune has the Sunday coupons in it! Get them a day early, and for only $1! If you don't find inserts in the Saturday papers or can't get out to get the paper on Saturday, the Sunday Star costs only $2, and is available at the same locations on Sunday. Where can I buy the Star Tribune? They are available first thing Saturday morning at most newsstands in the Fargo Moorhead area, such as Grocery stores, Gas Stations, even Drugstores like Walgreens and CVS! And, stores like Walmart and Target don't carry the newspapers. How many papers should I buy? When you're starting out, I'd say that 2 is enough just so that you're not overwhelmed. I quickly started buying 4 papers once I understood the benefit. The benefit is that when an item goes on it's rock bottom sale price combined with a coupon, you can buy 4 rather than just 1, since you bought 4 papers and have 4 coupons. This is part of my "buy-ahead" philosophy. We have a family of 3, and one is young child, so if you have a larger family, you might start with 4 papers. Now that I have a pretty well-stocked pantry and stockpile of necessities, I often opt for only 2 papers. Even now, though, if there is a week with several inserts or a few coupons I know I'll use, I buy 4 or more. Check the paper for the inserts you're expecting before you buy - just to be sure all are included. I like to know what to expect before I head out to get the paper. For a full preview, head on over to the Sunday Coupon Preview. If you know that there are 2 inserts scheduled for the weekend and find a paper with only 1 insert, you'll know to keep looking. If you don't find what you were expecting, it's possible the machine missed that paper, or that our area just didn't receive it. It's hard to know which. However, I often post a coupon preview on Saturdays, where others share what inserts they found. Hopefully that's a good resource! There are several brands of inserts in the paper. They are: SmartSource, RedPlum, P&G, and General Mills. When I refer to a coupon found in a coupon insert from the paper, I'll refer to it as the 3/14 SS if it was from the SmartSource. Or, 1/31 RP for the RedPlum insert from 1/31. Note: I've had readers suggest the Twin Cities Pioneer Press as an alternative to the Star Tribune, if you can't find the Star on Saturdays. The Pioneer Press costs $1 on Saturday and Sunday and carries more coupons than the Fargo Forum. However, you will find that the Pioneer Press tends to have slightly fewer coupons than the Star Tribune. Last Minute Dave Ramsey Giveaway! Wow, how fun is this? My first giveaway, compliments of my awesome friend, Penny! 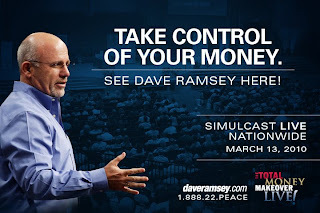 I mentioned the Dave Ramsey Live Simulcast yesterday. This event is happening TOMORROW, Saturday, from 12-5. And, here is your opportunity to go for FREE! The winner will get 2 FREE tickets to pick up tomorrow at the event at Bethel Church in Fargo! Interested? Leave a comment on the blog (click here if you're reading this in an email feed) with your email address and I'll choose the winner randomly from the comments at 9:30 PM tonight! Shortest giveaway in history, so enter now! I'll announce the winner on the blog and email the winner at 9:30PM tonight! And, while you're at it, check out Penny's photography here ! I picked a bag of these Clementines last week at the Moorhead Walgreens, and thought it was such a random thing. But just today I saw them advertised on the sign outside, so apparently it's still going on. $2.99 is a great price for a bag of these awesome little fruits! Anyone know if Fargo Walgreens has these as well? Dave Ramsey - Total Money Makeover LIVE Event Simulcast! This weekend, you have an incredible opportunity to see Dave Ramsey LIVE in our area! Bethel Church in Fargo is hosting a Live Nationwide Simulcast of Dave Ramsey's Total Money Makeover Live Event! To see a preview of the Simulcast, click the image above! My husband and I are going through his 13 week class, Financial Peace University for the second time right now, and without hesitation we would tell you that being taught and inspired by Dave in regards to finances has changed our lives. Tickets are: $15 for individuals ($10 for Students/Military) and $20 per couple. Purchase tickets at Bethel's website or at the Bethel Office. To see a trailer or more information, go here. Or, call the Bethel Office at 701-232-4476. If you're able, I would highly recommend attending! How cool is this? I was just recommended this site by a friend. Great Plains Live is a site where you can buy gift cards to local businesses at a reduced rate! Head on over here to see all the discounts that are available. My personal favorite? Buy a $15 Rapid Refill gift card for $10! I LOVE Rapid Refill, but haven't gotten coupons in the mail since we moved over to Moorhead a few months ago, so this is PERFECT for me! I find that I use about one cartridge per month printing coupons. Another fave? The restaurant gift cards! If you're willing to plan ahead with your eating out, you can save big! And, since they are Gift Cards, you can still use coupons on your meal order if you have them. There are LOTS more! Even discounts for traveling to the Minneapolis area. Head on over here to see all the discounts that are available! Choose delivery by USPS for an extra $1, or choose pickup to pick them up yourself in Fargo for no shipping charge! EDIT: I ordered some Rapid Refill gift certificates just last night and was able to pick them up right away this morning. They are located at 64 Broadway, at AM 1100 The Flag. And, they were super friendly! Empire Apples, 3 lb bag only .99! Food Club Pasta, 32 oz packages .98! There is rumor of a Catalina promo thru Wednesday 3/10 where you buy 3 Kellogg's kids cereals, and get $1 back. Buy 4, get $3 back, Buy 5 and get $4 back. If this is working as I've heard, here is the scenario: buy 5, pay $5 after coupons and get $4 back! Final price: $1.19, or .60 each! Here are the deals as I see them this week. Feel free to leave any comments with questions or any deals I missed! And lots of other pork sales... A great week to watch the reduced meat rack for quick sale meat! This can work out to make a pretty good price on Gold'n Plump chicken, depending on the packages you buy. There are smaller packs of drums and thighs for $2.99, larger packs of thighs, drums and variety packs for $5.99, and smaller packs of boneless skinless breasts for $5.99. Be sure to use the .75 coupon here and the $1 coupon here. You can use 1 Manufacturer's coupon on each package purchased, in addition to the $10/$25 Sunmart coupon. I have several of these coupons laying around from the last few months, so it's a prefect time to stock up on chicken! Buy 15 lb bag Russet Potatoes at $2.97, get 1 lb Carrots and 3 lb Onions FREE with in-ad Sunmart coupons! Final price: .99 each when you buy 2! Use the $1/2 coupons in blinking Smartsource machines found in the dairy case or that were previously available to print. Moorhead College Students - Books for Bags! This week only, March 8-14, the City of Moorhead is offering a sandbagging incentive to local college students. Students at MSUM, Concordia and MSCTC can earn a $10 Gift card to their college or university book store for every 2 hours of sandbagging! Now this deal is while suppplies last only, so get on out there if you are a Moorhead college student! Students should present their ID's upon check-in and check-out. Sandbagging is taking place at the Public Works facility, 700 15th Ave N. Hours are Monday-Saturday 7AM-7PM and Sunday 12PM-7PM. Not a bad deal for something we should probably all be doing anyway! For more info, head over to the City's blog here. It's a GREAT Day for Coupons! It's been awhile since we've seen such a great week for coupons! There are 3 inserts in the Star Tribune: a Smartsource, a RedPlum and a Proctor & Gamble. A great week to buy a few - I bought 4 this week just because there were so many awesome coupons! If you're new around here, this Cheapskate recommends the Minneapolis Star Tribune, which is available at newstands across the FM area like grocery stores and gas stations. Get out and get those coupons! Menards Weekend Sale - Ends Today! I didn't realize Menards was doing a 3-day sale til I saw a post from friend and reader Stacy S on FM Cheapskate's facebook page yesterday. Head on over and become a fan if you're not already! There are a few deals worth mentioning! 10' White U-Style Vinyl Gutter FREE after Mail-In-Rebate and $10 non-rebate purchase! Limit 10 per household, $3 each before rebate. 4 pack AA or AAA Rayovac Alkaline Batteries FREE after Mail-In-Rebate with $10 non-rebate purchase! Limit 4, $2 each before rebate. Most Menards FREE rebate items require you to spend an additional $10 on non-rebated items. We try to keep a running list of smaller items that we need around the house, so that we spend $10 on something that we already need in order to get the FREE after MIR items. There are many more FREE after MIR items that started today, but I'll post seperately about them soon! Dakota Growers Mac and Cheese .34 each! Final price: .38 per cup! Use 2 $2 coupons (if you have 2 computers and another adult who can register) and 1 $1 coupon. Final price: $2, or .50 each! Final price: $2, or .50 per box! But, it gets better. There is a Catalina promotion running on Betty Crocker Fruit Snacks through 3/21. I can't confirm whether or not it is running at Hornbacher's, but if it is you'll receive a $2.50 catalina coupon at checkout for buying 4 fruit snacks! Final price: $1.50 for all 4, only .38 each! If you confirm whether or not this is working at Hornbacher's please come back and leave us a comment! Sorry so late this week on Hornbacher's! Did you see any other great deals this week that I missed? Even More Old Orchard Coupons! You can now print even more Old Orchard coupons here on Old Orchard's website. If you have printed these before, you may not be able to print them again. At Cashwise, this week, the 64 oz juice cocktails are only .99, so FREE after the .50/1 Old Orchard juice product coupon, and Sunmart has them for only $1.49, so .49 after the coupon. Also, Cashwise has the OJ Frozen concentrates $1.25, and many others for $1.18. Use the $1/4 coupon, and pay only $1 each! At Sunmart, the OJ Concentrates are $1.29 each, so only $1.04 each after coupon! OJ doesn't usually go that low, so it's a great price! These are regular prices, or sale prices good for several weeks. Have one to add? Free free to leave a comment or email me! Use the $2 coupon from the 1/31 coupon inserts - Hurry, it expires on Sunday, 3/7! From now on, I'll keep an ongoing list of Cashwise coupon deals til they expire and post this at the bottom of thee weekly deals posts for easy reference. Again, if you spot a great deal - feel free to add it as a comment or email me! Here is an ongoing list of deals good at Sunmart. From now on, I'll list these below the weekly deals in my Sunmart weekly deals posts. Final price: $1.79 for the Bread, $1.55 for the Thin Buns! Use the .60/2 gallons coupon from the (will double to $1/2) - Hurry, expires 3/6! Final price: .50 off each gallon of milk! OK, so... only people who regularly print way too many coupons at home can understand the comedy of this video. I would understand if you think I'm crazy, because a video of my printer printing coupons shouldn't be this funny. But I can't stop laughing and had to share it with you. Maybe because it reminds me of an off balance washing machine. Maybe because at the end, the printer light starts blinking, as if I wouldn't already be aware there's a problem. Whatever the case, I know I'm exposing myself as the coupon nerd that I am by posting this, but I can't help it. I'm tired of laughing alone. Make sure you're volume is up good 'n loud for this. It's a GREAT week at Cashwise! 2 Westpac Frozen Vegetables, 16 oz FREE with coupon and $25 purchase! Bonus coupon: FREE 1st lb Bananas with $25 purchase and coupon! This coupon was in the Sunday Weekly ad and can be printed online here. It is NOT available in store, and the coupon states one per family. To print, click on the coupon, which will add it to your "shopping list." Print your shopping list, and the coupons will print, even if there is nothing else on your "list." Tip: These FREE with $25 purchase coupons can be used together, getting all 3 items FREE with only 1 qualifying $25 purchase, so make sure to have both coupons with you! More Bonus Coupons - online and in the Sunday Ad only! Remember, the Bonus Coupons aren't available in store! Be sure to print them here before you shop! Comes out to be $1.40/lb - not bad for boneless skinless breasts! Final price after both coupons: .21 each! Use the $1 coupon from the March issue of All You Magazine. (If it doesn't specify "from the produce section." We have a coupon from the 1/24 coupon inserts for $1 off Marzetti Salad Dressing, but it states "From the produce section," which this type of dressing is not, at least I think. Final price: .27 each when you buy 5! Final price: $1.00 each when you buy 4! Final price: Some products as low as .99! I'm listing only the items that I'd consider a good buy or that have coupons to make them a good buy. Final price: $3, or .75/lb! Final price: $3 for all 4, only .75 each! Use the .75/1 Italian Four Cheese coupon here, (will double to $1) if this variety is on sale. I couldn't find it on Cashwise' website. Final price: $1.50 - a pretty decent price for Quaker cereals! HOT New Old Orchard Coupons! They just keep coming! 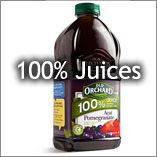 Coupons.com has released 2 new Old Orchard coupons that happen to make for really inexpensive and even FREE juice this week at Cashwise and Sunmart. At Cashwise, this week, the 64 oz juice cocktails are only .99, so FREE after the .50/1 Old Orhcard juice product coupon here, and Sunmart has them for only $1.49, so .49 after the coupon. Also, Cashwise has the OJ Frozen concentrates $1.25. Use the $1/4 coupon here, and pay only $1 each! At Sunmart, the OJ Concentrates are $1.29 each, so only $1.04 each after coupon! OJ doesn't usually go that low, so it's a great price! Not sure if I've shared this tip with you all before, so here goes. Most all of the coupons on Coupons.com have 2 prints per computer. However, after the first print, the coupon tends to migrate back to the last page. So, after you print it one time, scroll back to the last few pages to make sure to get both of your 2 prints per computer. Have 2 computers in the house? Fabulous, you'll get 4 copies of each coupon! Free or low priced items like these keep well, so buy as many now as you can for FREE or cheap, and you won't have to buy it later for full price! Holiday Stations has released a few new coupons! Go here to print a coupon for a FREE 20 oz Coffee or Cappuccino with any purchase, expires 3/14. And here for a coupon for a FREE 16 oz HP juice with any purchase, expires 3/31. Aquastar Tilapia Fillets, 2 lbs $3.99! I always mention this sale, not necessarily because it is a great price on pork chops (more then $3/lb), but because this is a great week to shop the "reduced for quick sale" section at your Sunmart store. If you haven't found this section before, ask at the meat counter and they'll show you. It's often a small section hidden in the back of the meat department. Now, this meat does need to be used within a few days or frozen for later use. However, this is one of my best tips for getting a great price on meat. When these econopacks of pork chops go on sale 10/10, you can often find the 10 packs for as little as $6 (less than $2/lb) in the reduced meat section! Red or Green Chilean Grapes .97/lb! Note: Though the in-ad coupons for freezer items say Manufacturer's coupon, most of them also specify that they are good ONLY at Nash Finch supplied stores (like Sunmart). However, there are a few on the back that don't give that specification. In the case of these coupons, use them anywhere you'd like to get the best price! Final price: $1.04 each when you buy 4! Use the $1 coupon here. Final price: $3.99 - I don't exactly know what a great price is on string cheese, but I know this is a large pack. Is this a good price? Also, Sunmart has lots of Our Family coupons here. Let us know if you find any great deals with these coupons!